Let me just say what everyone is thinking, thank god that 10-game road trip is over! To be fair, the Tampa Bay Rays performed fairly well against the Houston Astros and Oakland Athletics…well, better than they had against Texas. They were able to win some games against some pretty good pitchers, and the good guys four of their last seven. That being said, their showing Sunday looked more like the softball team I play on, and less like a team vying for a playoff berth. In the end Tampa Bay couldn’t win its first-ever road sweep of Oakland, although the team was able to take two-of-three from the A’s. After a well needed off-day Monday, the Rays will welcome another fringe contender into the Trop, the Minnesota Twins. Let’s take look at some of the peaks and valleys from the week past. The Rays entered the only other citrus themed facility in the bigs on Monday to start a four game set against the Houston Astros. Erasmo Ramirez earned his 10th win of the year, holding Houston’s powerful bats to just two single tallies on six scattered hits, including an opposite field homer to Evan Gattis on a pitch that was well out of the zone. For the life of me, I still cannot understand how Gattis poked that fastball to right-field! The offense supported Erasmo — and the pitchers that followed — with nine runs of support, while going 6-17 wRISP (.353 BA) and scoring six two-out runs. However, fortune did not favor the Rays on Tuesday and Wednesday, after they dropped a pair of extra inning contests by a 3-2 margin. The bullpen failed the team in both games, although they walked away from Tuesday’s fiasco with a far worse predicament — Jake McGee became the injury bug’s next victim when the lefty tore the meniscus in his left knee on the second to last pitch of his outing. McGee, who is expected to miss 6-8 weeks after going under the knife, will likely miss the rest of the regular season. Kevin Cash said they will use several pitchers to take McGee’s late-inning role, including lefty Xavier Cedenno and righties Steve Geltz, Brandon Gomes and Alex Colome. He also said this less than operative situation doesn’t automatically mean Brad Boxberger will become the full-time closer. Rather there could still be situations where Boxberger pitches in the eighth, and one of the others closes out the game. 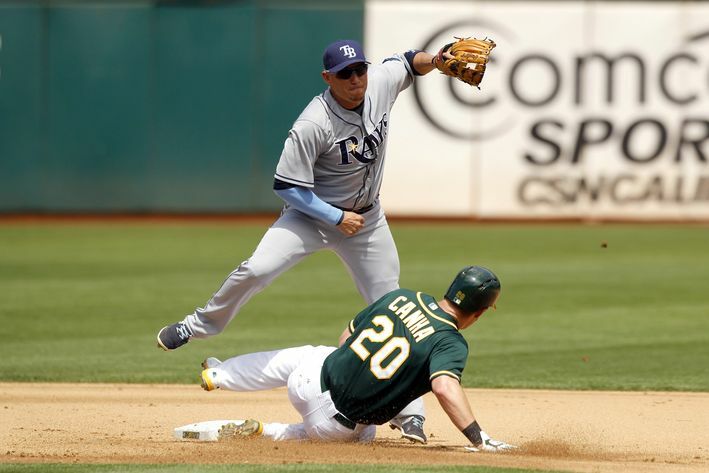 The westward trek continued in Oakland on Friday, when Drew Smyly and Desmond Jennings led Tampa Bay to a 2-1 win. Smyly bounced back from a disappointing start against Texas by scattering seven singles and fanning two. And while his start wasn’t spectacular, he was good enough to keep Oakland at bay. The lefty focused more on pitching to contact, and — playing off the Athletics aggressiveness at the plate — forced a good number of weak poppers and fly balls. 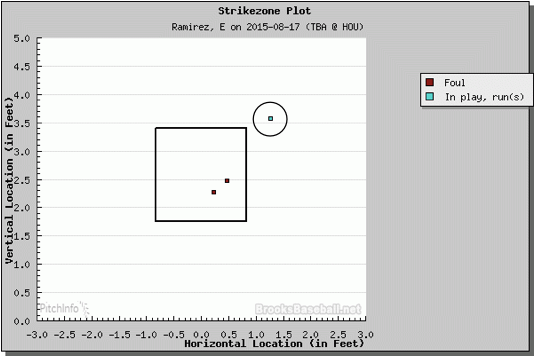 More importantly though, his command was much better and he was able to locate all of his pitches. Up by two runs in the ninth, Boxberger took over and almost allowed another walkoff loss. Instead he eventually settled down to earn his 30th save. On Saturday, for the first time in 50 previous attempts, Tampa Bay notched its first ninth-inning comeback of the season as the team rallied for two runs late to win 5-4. Logan Forsythe, John Jaso, and Asdrubal Cabrera combined to tag Sonny Gray for three home runs, and the Rays became the first team to do as much off the excellent righty. Previous to that, Gray had given up only two homers in one game. Equally as impressive though, Alex Colome, who was the only reliever used by Cash, entered the game in the eighth inning and retired all six batters he faced (over a two inning spread) on an incredibly efficient 20 pitches. In 11 relief appearances and 17-1/3 innings since the All-Star break, Colome has allowed just one earned run. Only time will tell, but the former starter could be an apt replacement for McGee while he recoups from surgery. It might be best if we just skip over the series finale. Better yet, read FanGraphs’ game recap whilst listening to the Benny Hill theme song.